OF almost 448,000 prime beef carcases sampled by AHDB during 2015 45 per cent failed to meet target specification. 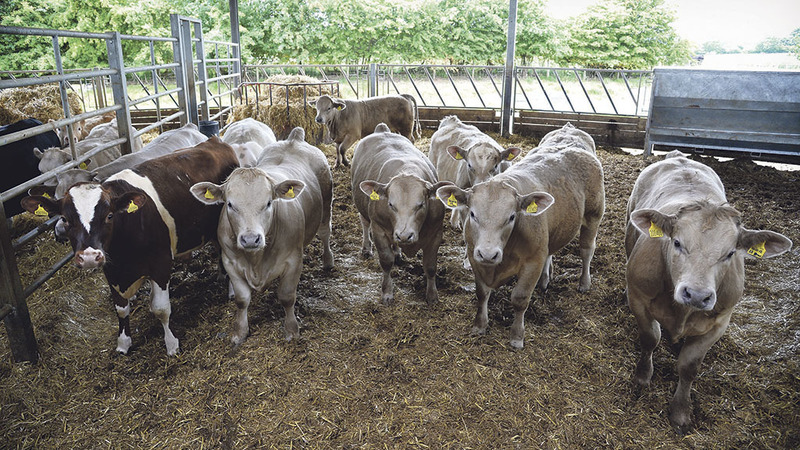 KW nutritionist, Charlotte Ward says: “Some processors have now increased the maximum penalties for out-of-specification carcases to 40-50p/kg dead carcase weight (DCW)*. “That can knock £200/head off the sale price for a 400kg continental carcase, or reduce the value of a typical native breed by £150/head. “More importantly, it’s a loss that can largely be avoided if feed choice and rations are properly matched to breed and growth targets.”OF almost 448,000 prime beef carcases sampled by AHDB during 2015 45 per cent failed to meet target specification. This represents an avoidable loss to the beef finisher which could add up to £200/head, and which even at conservative estimates could total £38 million or more across the 1.9 million prime cattle slaughtered in the UK last year. 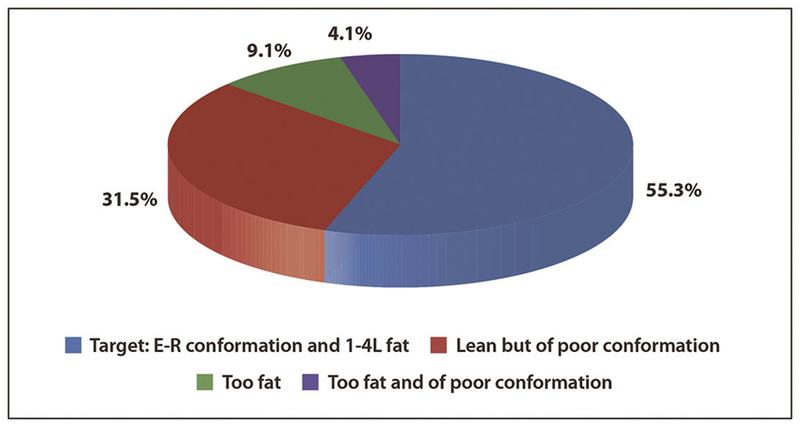 The AHDB figures show that only 55 per cent of the carcases sampled fell within conformation classes E to R and fat scores 1 to 4L. Of the carcases outside this specification, 9 per cent were overfat, 4 per cent were overfat with poor conformation, and 32 per cent were lean but with poor confirmation. “Gathering and reviewing data on current performance is critical, as this will highlight which cattle are consistently grading within processor specification and providing the highest return,” Ms Ward says. 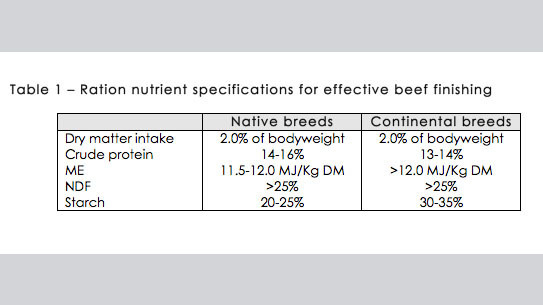 According to Ms Ward, one factor often overlooked is the considerable difference between continental and native breeds in the nutrients required for effective finishing (table 1). Cattle will also finish poorly if feed cost per tonne is put ahead of feed value, in terms of nutrient supply, ration balance and intake potential. “The key is to meet nutrient requirements whilst also maintaining good rumen function and minimising ration cost. “For example, achieving the necessary ration energy density is critical if liveweight gain and fat cover targets are to be met, and many rations based on typical 10.0‑11.0MJ ME/kg DM silages will need an additional energy boost. Ms Ward says: “Another critical factor is the balance between starch and protein. Native breeds and heifers are earlier maturing and start laying down fat sooner, so need a higher level of protein and less starch to meet target specification. Research carried out by Harper Adams University College using continental-cross-Holstein bulls found that increasing the ration crude protein from 12 to 14 per cent improved both feed efficiency and growth rate. The result was a six-day reduction in finishing times and a £32/head lift in margin over feed. Ms Wards says: “Using dual purpose feeds like wheat distillers’ feed or wheat-gluten moist feed to raise ration energy density is a great way to also increase protein content. Plus the added palatability these feeds bring to the ration will help drive intakes. * Based on AHDB 2015 average prime cattle DCW of 356kg, 45 per cent of cattle missing specification, and estimated average penalty of 12.5p/kg.